As we sit here typing this, it can only mean one thing, 2018 is nearly over and it is time that Jack and I extend a huge thank you to the readers and our team, who helped Miketendo64 make it through to the end of the year. Running a Nintendo media site, especially during the Nintendo Switch era, is no easy task and it gets harder every year and yet, because of everyone who supports us, we’re still here, we’re still swinging and 2018 was just incredible and not just for us. Jack: I don’t know about you, but 2018 got started in a fantastic way. There were rumours of an impending Nintendo Direct and hype took over in a huge way. The longer we went without an announcement, the more desperate gamers became. Literally every tweet toward Nintendo asked when a direct would be announced and instead of giving us an answer straight away, Nintendo actually took to teasing us over a course of a few days before an announcement finally came. The hype was indeed real and Nintendo got a whole lot of social media promotion, all thanks to a rumoured direct that eventually became a reality. Honorary Mention: Remember January 18, 2018? Aka Labo Day? This was the day we first got a glimpse at Labo and for nearly a whole week after, conversations about cardboard was all over Twitter and I absolutely enjoyed it. Jack: Although I never personally experienced the series until I played both instalments of Bayonetta on the Nintendo Wii U, I swiftly became a huge fan of the series and needed more of it in my life. Sure, we still know nothing about Bayonetta 3, but Bayonetta 3 wasn’t the only Bayonetta game revealed during The Game Awards, as a Switch port of both previous games was confirmed and February was the month in which I could finally play them on the go. For me personally, those ports are 2 games I wasn’t expecting but am grateful for receiving as I love them both, even though Bayonetta 2 is a little toned down in comparison to the first game. Honorary Mention: To coincide with the release of Bayonetta 1 and Bayonetta 2, Miketendo64 hosted a new theme week entitled “#BayonettaWeek” and February 2018 swiftly became our most popular month ever, at the current moment in time. Mike: March celebrates the first anniversary since the release of the Nintendo Switch. The Switch had a spectacular first year, selling 17.79 million copies in 12 months. The release of Mario Kart 8 Deluxe, The Legend of Zelda: Breath of the Wild, Splatoon 2 and Super Mario Odyssey in the Launch year helped solidify the success of the Nintendo Switch. It easily beat the lifetime sales of the Wii U which, has yet to make 14 million through its 5 years on the market. Honorary Mention: The loveable pink-puff ball Kirby made his Nintendo Switch Debut and he didn’t come alone. This time Kirby brought friends and a fair amount of them. Kirby Star Allies allowed up to four players to work together as they journeyed through the many stages in order to save Dream Land. The game had a decent amount of content to begin with and had three waves of additional content added to the game, bringing new Dream Friends and extra game modes. Jack: If you had told me back in early April, that I would take a lot of enjoyment from assembling cardboard, I wouldn’t have believed you. Yet, with my curiosity getting the better of me, I picked up the Nintendo Labo Variety Kit and I had a huge amount of fun putting it together. Even my mum and my sister wanted to be involved with the process and we generally enjoyed it. Just like how we generally enjoyed playing with it afterwards. Honorary Mention: Being the month for foolery, April Fool’s was pretty great in 2018, especially since it gave us 8-Bit Pokémon Go for a limited time. 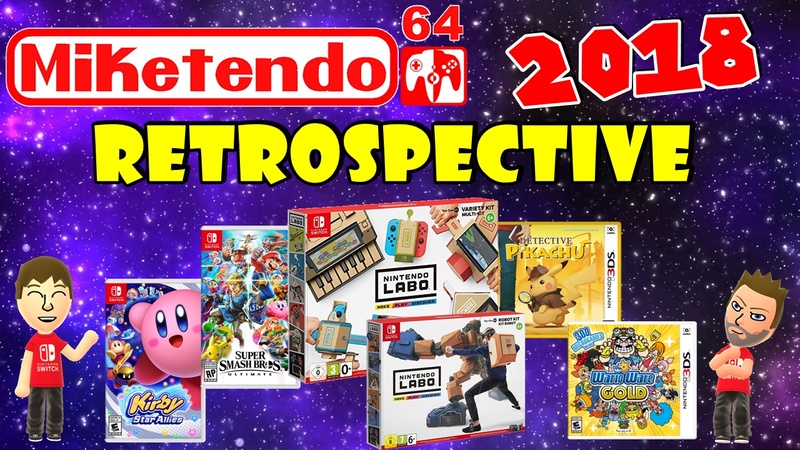 Jack: You’re welcome to say this one is a cop out, but with Miketendo64 actually starting on May 5, 2015, in May we celebrated our third anniversary and made a new list of goals that we hoped to achieve in our fourth year. We might not have hit them all, but in other aspects, we really hit it out of the ballpark and this would swiftly become the month that would act as a huge turning point and we never even knew it. Honorary Mention: Once again hype got out of hand, this time with regards to Pokémon news and thanks to a secret press event, Pokémon news did indeed drop and that news concerned both Let’s Go Pokémon games and the free to download Pokémon Quest for Nintendo Switch, which later came to mobile devices. Mike: June gives us the biggest Gaming Expo event of the year – E3. In 2016, Nintendo went all out with The Legend of Zelda: Breath of the Wild. 2017, Nintendo had created a huge stage based on New Donk City to promote Super Mario Odyssey. This year was all about Smash! Super Smash Bros Ultimate to be precise. Ultimate in name and Ultimate in nature, Super Smash Bros. Ultimate dominated over everything else at E3. The Super Smash Bros Ultimate Open Invitational 2018 was also hosted at the event and it was certainly a spectacle to behold. Retired Smash Bros Champion ZeRo made a return and managed to retain his title as world champion. Honorary Mention: Splatoon 2 received the Octo Expansion DLC that added a whole new world to discover beneath the bustling city of Inkopolis. Mario + Rabbids: Kingdom Battle also got its own expansion With the Donkey Kong Adventure. Introducing two new characters including the great ape himself. It was a welcome addition and expanded on the already stellar title that was Mario + Rabbids: Kingdom Battle. Mike: It might not mean much to anyone else in the world but we were invited to attend the Gamepolis 2018 Gaming event in Spain as Press. We were given a closed doors presentation of Super Mario Party and were allowed get hands-on with the likes of Pokémon: Let’s Go, Pikachu! & Pokémon: Let’s Go, Eevee!, Starlink: Battle For Atlas, Killer Queen Black, Super Smash Bros Ultimate and Monster Hunter Generations. It was the first event after E3 2018 to have Super Smash Bros Ultimate playable outside of the US and we were one of the lucky ones to get a private session. Honorary Mention: Despite owning multiple Nintendo Wii, GO VACATION was a game that never made it onto my radar, yet thanks to the Switch release, it gave me an enjoyable summer game to sink my teeth into, while Jack was off enjoying WarioWare Gold on his 3DS. Jack: DOOM Eternal may have been revealed at E3 but it was in early August where we got to learn plenty about it, which included discovering the fact that not only is a Nintendo Switch release planned and that Panic Button Games would be behind it, but it would launch at the same time the game drops on other platforms. Honorary Mention: Gamescom might not have been absolutely stellar this year, but in addition to a great Torna and Daemon X Machina presentation, we also got the announcement that Saints Row: The Third – The Full Package, would grace the Nintendo Switch in 2019. Jack: Time to shout it from the rooftops for September was the month we were truly blessed. While for a lot of you, Super Smash Bros. Ultimate is the best game on Nintendo Switch in 2018, for me that is not the case. I have played Smash for more than 110 hours and Xenoblade Chronicles 2: Torna – The Golden Country, is Nintendo Switch game of the year. It was what I hoped it would be, it was a huge improvement over the main game and it swiftly became my RPG obsession, as it did more for me than Octopath Traveler ever did. Honorary Mention: Despite a limited release that has still not been expanded yet, September 2018 was the month Dragalia Lost finally released and, regardless of its limited audience, the new RPG has done rather well for itself and continues to impress even now. Now come on already Nintendo, Europe, Canada, South America, Australia and New Zealand, want it too! We also happened to get Final Fantasy XV: Pocket Edition HD just days ahead of Torna and thanks to a recent direct, Final Fantasy X, a game I have wanted on Switch for more than a year, was finally announced to be coming and that it would be joined by Final Fantasy X2 and a couple of other Final Fantasy games as well. Mike: October saw the release of Nintendo’s biggest party game – Super Mario Party. The game was a return to form, recapturing the essence of the original Mario Party games while providing something new as well. It is fun, competitive and though it still has the power to destroy friendships. You will keep coming back for more of it. Honorary Mention: Ubisoft’s Starlink: Battle For Atlas was released across multiple platforms. The Switch version came with an exclusive pilot and ship in the form of Fox McCloud of StarFox and his signature Arwing. Mike: November 2018 saw what could be a first in a new series of Pokémon Games. Pokémon: Let’s Go, Pikachu! & Pokémon: Let’s Go, Eevee! was a re-imagining of the original Pokémon Yellow game with the original 151 Pocket Monsters. It released on November 16th which just so happens to be Shigeru Miyamoto’s birthday. Not that he had anything to do with the Pokémon: Let’s Go games, I just wanted to share that tidbit with you. Honorary Mention: After three and a half years, our website celebrated 1,000,000 million views during the month of November, a week before my own birthday. What a gift that was. Mike: December was the biggest month of the year, especially for Switch owners and Smash Fans. Super Smash Bros. Ultimate released and it was a raving success. A number of outlets reported that Super Smash Bros. Ultimate had sold 3 million units worldwide, making it the fastest selling Switch game and the fastest selling Smash Bros Game ever. Honorary Mention: Miketendo64 joins the top 200,000 most popular websites according to ‘Website ranking’ website Alexa.com and celebrates its most popular month ever! Happy 2019 everyone and thank you, for everything, including you Nintendo!